Nitro World Games is the first of its kind. This massive action sports competition is broadcast live by NBC to millions of viewers across the country and live-streamed on social platforms for the entire world to enjoy. This one event combines FMX, BMX, skate, inline, and scooter competitions into one action-packed show, full of record-breaking tricks and World First tricks. 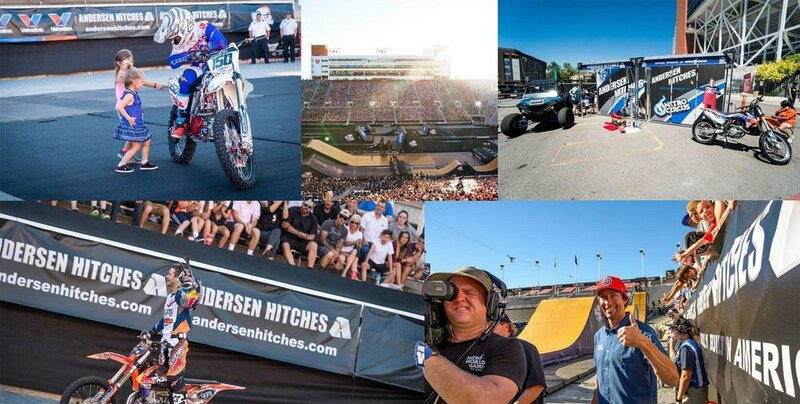 The Porter Pro Media team saw the second-annual Nitro World Games and the 2017 US Regional Tour as an opportunity for Andersen Hitches to gain massive brand-recognition from the perfect audience: people who live for action sports and need an easy way to tow their toy trailers and gear. With the potential to get the Andersen Hitches brand and products in front of millions of people, Porter Pro Media got to work putting together the perfect pitch. With over 20 shows scheduled for the 2017 US Regional Tour, we needed to put together a branding package that would work with the budget but resonate with the viewership. We decided that the best way to do this would be three-fold: advertise on-site at each show, produce memorable productions and images, and broadcast those productions during the event and on social media. By putting together branding material that could be used on-site, Andersen Hitches was able to have their logo on the legendary 50-foot Giganto-Ramp, demonstrate and sell products at their custom booth, and show off the Andersen Hitches toy hauler. These branding measures, along with regular shout-outs from the athletes and announcers, would help spark name-recognition before any video advertisements were shared with the viewership. We created five, unique and memorable productions that were played on the jumbo screen at each Nitro World Games event, broadcast on NBC, and shared on Facebook, YouTube, and Instagram. Each production features an Andersen Hitches product in a way like never before. Mountain biking in Jackson Hole, Wyoming was a dream come true for the Nitro Circus athletes. Porter Pro Media had the opportunity to film these guys in their element. And at the end of the day, these downhill daredevils and the Andersen Hitches team packed up and hauled out of the Teton Pass with none other than the Rapid Hitch by Andersen Hitches. After hitching up the toy hauler, the Andersen Hitches crew took the Nitro Circus team to the dunes. The Andersen Hitches Rapid Hitch made unloading a breeze, which meant more time for shredding sand. From dirt bikes to sand rails, and even a little skiing, we had a good time unhitching with this group. Product education mixed with captivating imagery is always a winning combination. By showcasing the simple installation process of the Rapid Hitch and describing the safety aspects, we were able to create an ad that served two purposes. The Ultimate 5th Wheel Connection is a top-seller at Andersen Hitches, and for good reason! Some Nitro Circus fans would naturally be interested in a 5th wheel hitch so we created a video that would showcase the specifications visually. To show how light the hitch is, we chose to film a child carrying and lifting the hitch. These small details resonated well with the viewers. The Alumistinger is as sleek as it is functional. We wanted to speak to the practicality of this hitch and cater to an audience that depends on trailer hitches to be reliable and tough as they are.